Why do conservative evangelicals walk in lockstep with business interests? And what does this tell us about religion and capitalism in modern America? Guaranteed Pure takes us to the time before mega-churches and marketing blitzes to trace the entwined beginnings of modern evangelicalism and consumer capitalism. Both developed simultaneously between the Civil War and World War I. My story focuses on two generations of evangelicals associated with the celebrity revivalist Dwight L. Moody and his Moody Bible Institute (MBI) in Chicago. It includes business leaders like Henry Parson Crowell (the president and promotional guru of Quaker Oats), Ivy League seminarians, and a phalanx of middle-class professionals. At MBI these “corporate evangelicals” conducted their religious work using business techniques. But even more importantly, they used new ideas and practices born of business, law, and engineering to reinterpret their inherited faith. Thus, the cross-fertilization of business and conservative evangelicalism helped transform modern Protestantism and prepare the way for consumer capitalism. An individualistic, consumer-oriented “orthodoxy” displaced traditional communal creeds; new non-profit corporations undermined denominational authority. At a time when Protestants across the theological spectrum doubted the moral legitimacy of capitalism, this “old time religion” helped naturalize modern economic ideas. Indeed, the framework they developed a century ago shapes the belief and practice of conservative evangelicals today and facilitates their engagement with the modern world. 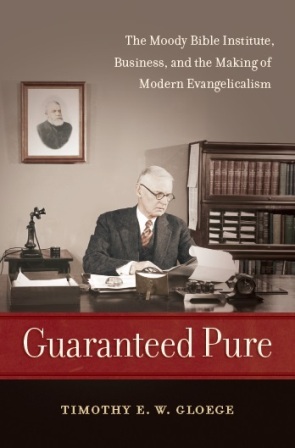 Guaranteed Pure is published by the University of North Carolina Press. View a list of reviews.